Leasowe Castle Hotel by night. 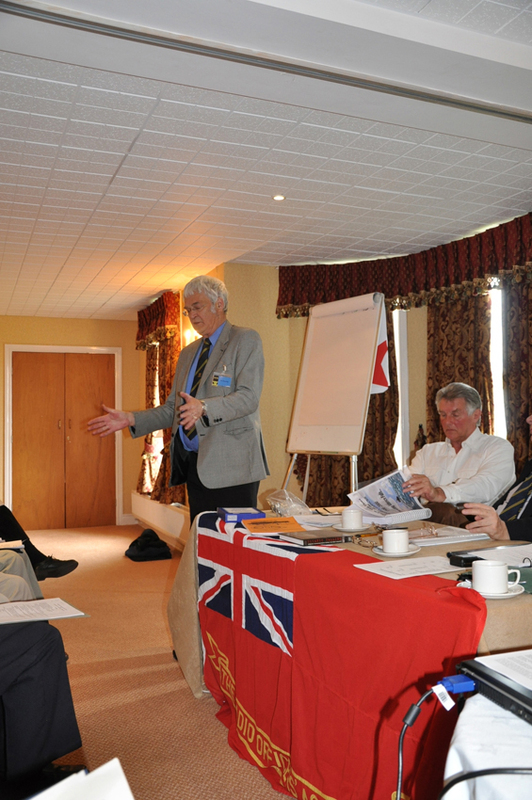 A most successful AGM was held at the above venue and we will shortly be publishing some photographs and brief reports. In the meantime the following has been culled from The Chairman’s Log in the June 2012 QSO to give those who did not attend a flavour of the event. The AGM itself was a great success and opinions have varied from “it was certainly one of the best” to “it was the best ever.” I think those comments are definitely at the quality end of the scale and ones we can certainly live with. The attendance for the AGM was the best for a good few years at 40 and an all comers record of 57 of us sat down for dinner. The event was admirably organised as always by Jim Loughlin and it was heart warming to see a beaming Treasurer, disguised as John Garner, as we had paid all our bills and made a slight profit – all wonderful happenings in the subterranean world of Treasurers. The afternoon visit was changed at relatively short notice to visit Fort Perch Rock in New Brighton, mainly because they had a well regarded Titanic exhibition. 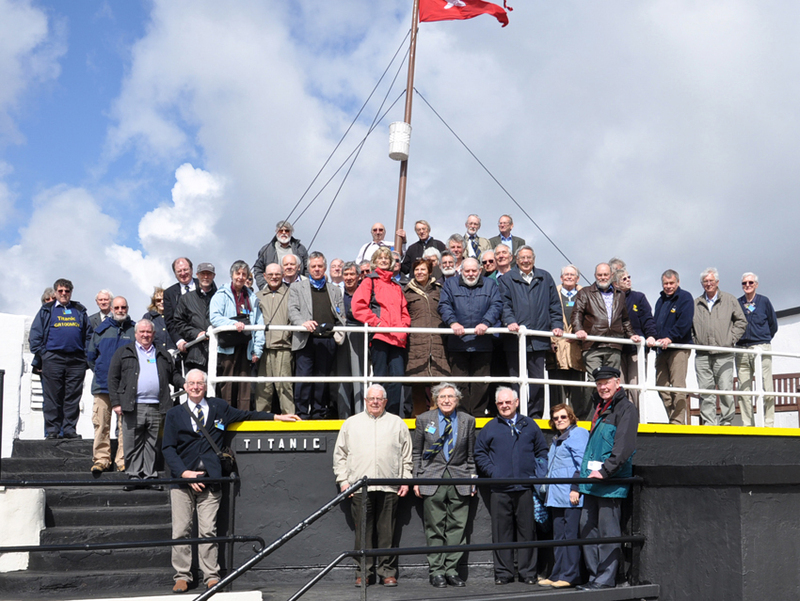 Even though we went there a couple of years ago the members I spoke to enjoyed the visit but we might perhaps have booked the return coach a little earlier as we stood in a distinctly nippy wind coming off the Irish Sea. Our thanks to Stan McNally for setting everything up so well for us. Our thanks also to the Leasowe Castle Hotel for once again looking after us admirably. We have decided to hold next year’s AGM in Chelmsford. Although Leasowe has looked after us very well for 4 years several people thought we needed a change and we also hope that a change of location might bring in a few new attendees from the South East of England. 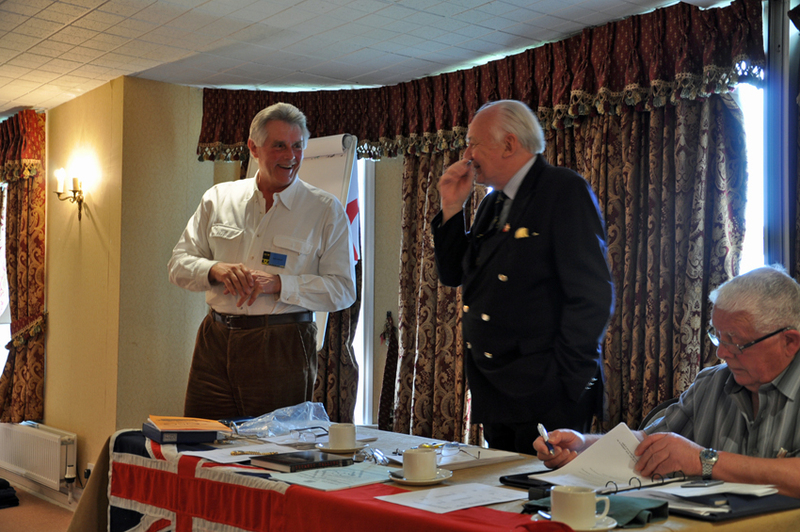 Ian Channing has done some excellent leg work and the event will take place over the weekend of 26 to 28th April 2013 at The Atlantic Hotel in Chelmsford. Fuller details will be published in due course. The use of badges this year was very popular and several members asked me to publish on the website what they looked like so that those who did not attend can see them. Can I also take this opportunity to remind AGM attendees to keep their badges for next year to reduce re-printing costs. This is page one of the proof before actually printing the badges themselves. The design is due to the ever excellent handiwork of Roger Bentley. 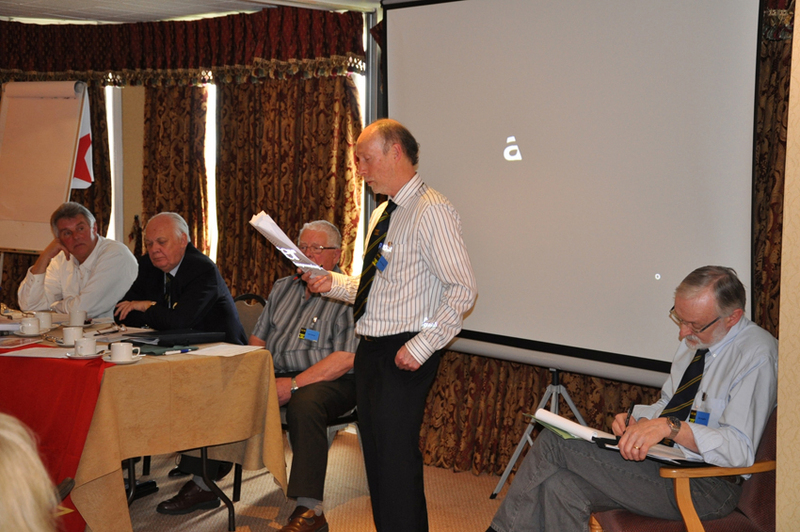 Various photos of events and individuals at the AGM will be added over the forthcoming days and weeks. 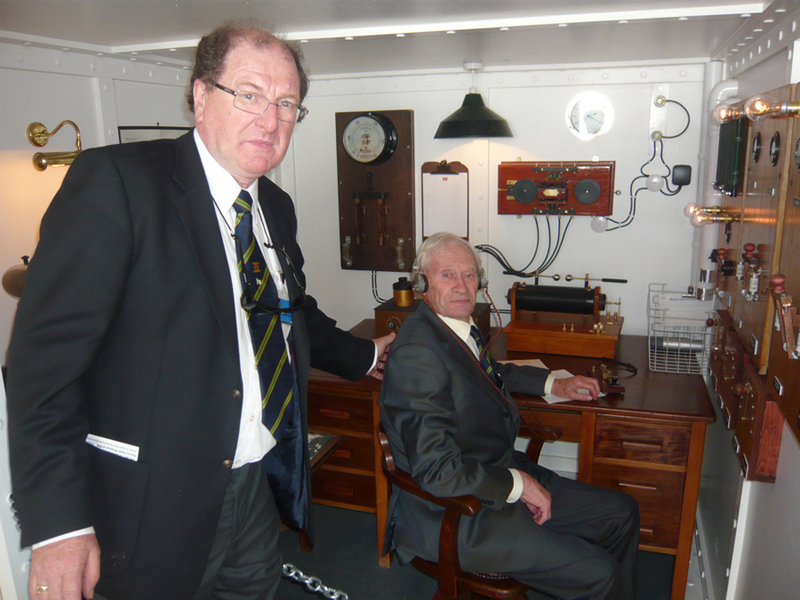 Vice Chairman Colman Shaughnessy and Albert Owings at the Titanic replica Radio Room at Fort Perch Rock on Saturday 21st April 2012. 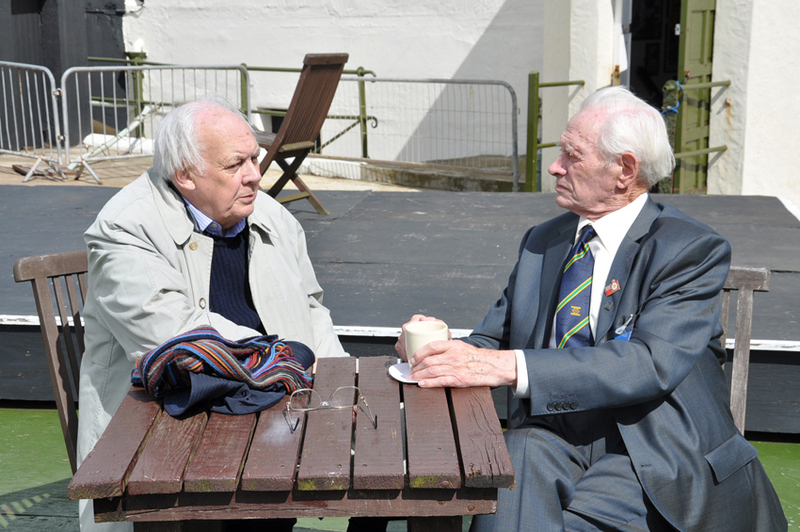 Albert is a regular and very popular attendee at AGM’s and is one of our trusty World War 2 veterans. 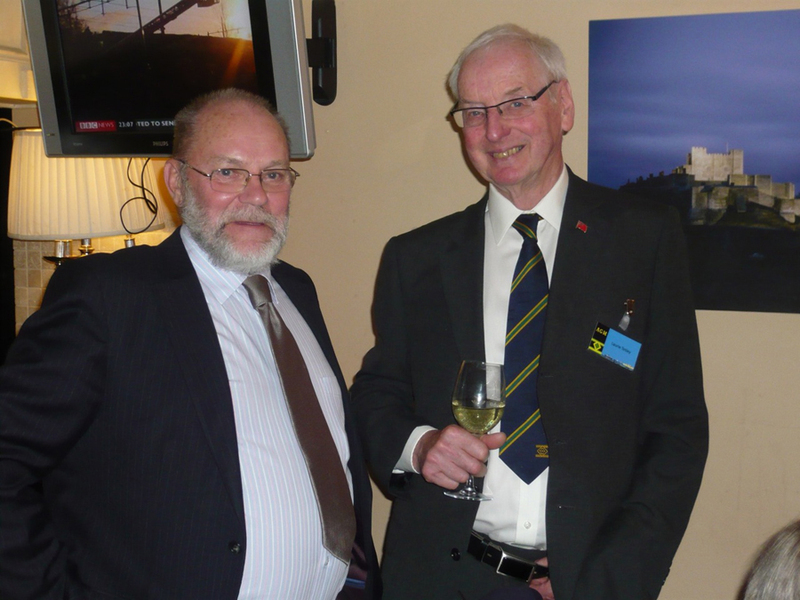 Two AGM attendees and ROA stalwarts in their usual position at the bar. Hon. Archivist Willie Williamson on the left and our official photographer Laurie Tetley on the right. Both of these gentlemen can be seen in their youth with photos in The Gallery. Incoming and outgoing Chairmen. Hilarity caused by disbelief when Tony suggested it was Brian’s round tonight. AGM group at Fort Perch Rock. A very similar photo is in the June QSO but I felt it was relevant to publish on the website as well. ROARS Chairman Tom Frawley gives his annual report. If you do not know all the faces, left to right seated, Tony Selman, Brian Cotton, Treasurer John Garner and Secretary Jim Loughlin. Our only Swiss member. John Schrempft in the Titanic Radio Room at Fort Perch Rock. 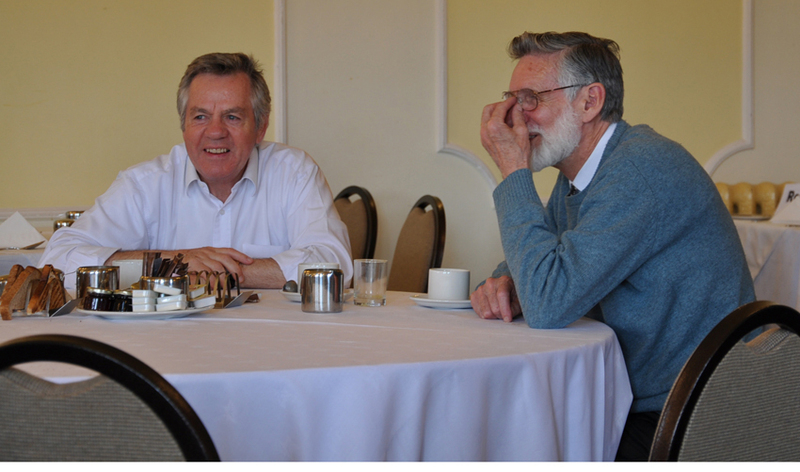 Thanks to John for supplying most of these AGM photos. Albert Owings paying his respects to the new President at Fort Perch Rock. A full Scottish breakfast. Joe Duffy and Bill MacKenzie on Sunday morning before setting off home. A pair of adopted Cornishmen. Despite rumours to the contrary Manchester and Liverpool can get on together. Geoff Valentine on the left with scouser John Garner. CQ CQ CQ!. The AGM badges look great but I’ve a wedding to attend next month and could do with a decent tie. Can anyone advise where the ROA tie can be got?. Due to personal circumstances I have not been able to attend the ROA AGM for three years. 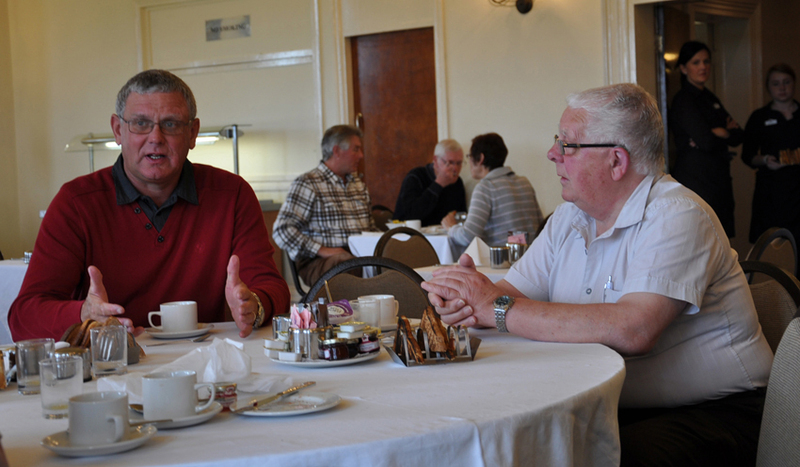 The 2012 event at Leasowe Castle must rank as one of the best I have ever attended- the committee and all members made this a very memorable weekend – well done to all. Hope to see you in 2013!! Many thanks for the acknowledgement of the photos. It was a great AGM and my first visit to an ROA meeting. My wife and I really enjoyed the days spent at Leasowe and the trip to Perch Rock. As a born and bred Scouser who became a Swiss Citizen but retained British Nationality, I’m hoping it doesn’t mean I’ve become like Jekyll and Hyde! I put this down for the record. Of all the neutrals Switzerland has the greatest right to distinction. She has been the sole international force linking the hideously sundered nations and ourselves. What does it matter whether she has been able to give us the commercial advantages we desire or has given too many to the Germans, to keep herself alive? She has been a democratic State, standing for freedom in self-defence among her mountains, and in thought, in spite of race, largely on our side. The link has a very interesting article in English, written by a Swiss Radio Officer who’s a friend of mine…. 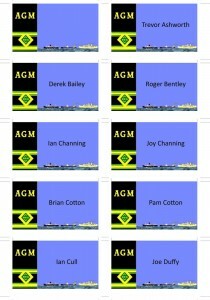 Congratulations to all involved in making the 2012 AGM “A Night to Remember”. Your teams effort was excellent and very much appreciated. Keep up the good work. I also enjoyed the “Full Scottish Breakfast” before my drive home to the frozen North. My Grandchildren & Great-Grandchildren thought the photos of me were “real cool”. They asked me if the group photo at Fort Perch Rock were all survivors of the Titanic.?? I replied ‘Yes…all except me’! !, as I’m too young at only aged 71…. 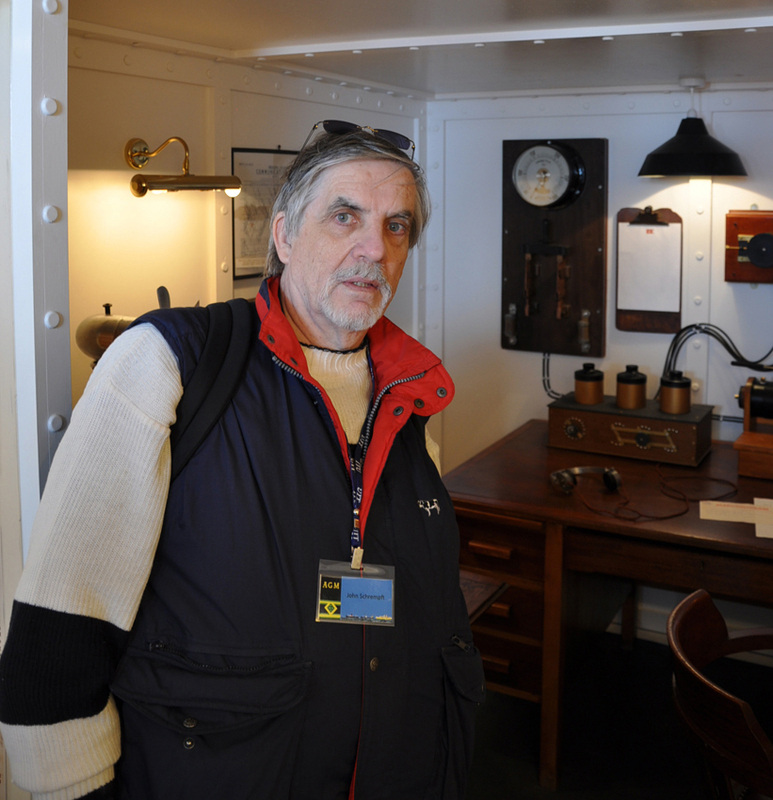 Looking fwd to seeing you all in 2013.
titanic wireless room opened by Peter Bibby at Fort Perch Rock 30th March. comment from curator of National maritime Museum Liverpool. quote – your exhibit is better than ours at the Maritime Museum unquote. comment from pr consultant at event. quote -Your exhibit is the best around Liverpool and I have visited them all unquote. Since the AGM is only days away from the 100th anniversary of the sinking of the Titanic, this sounds a lot better than the Boat Museum. Just a thought – will ROARS members get a chance to go on the air using the equipment? Yes they will. Fort Perch Rock has said that is possible and advised ROARS members to bring their own keys if they would like to do so. I am sure they will have a key available but members might want to bring their own. See message below. It is recommended you bring your own key if you want to go on air. The news page is looking great. Nice work.